THANKS FOR READING 'PHANTOMS & MONSTERS'! Click link - Thanks for another great year at 'Phantoms & Monsters'! 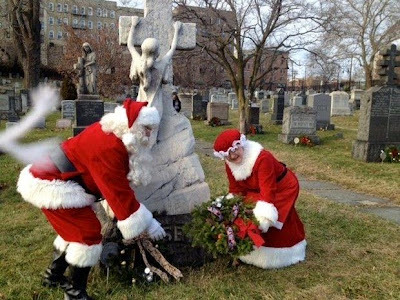 Was Jersey City visited by the Ghost of Christmas Past? Or was Santa touched by an angel? In this photo taken at the Historic Jersey City and Harsimus Cemetery, what appear to be white, ghostly hands reach out and touch Santa as he and Mrs. Claus lay down a wreath on an old grave. Cemetery director Eileen Markenstein snapped the photo during the Christmas tree lighting ceremony and holiday festivities last Saturday as Santa helped decorate the gravestone of the Losey brothers, both soldiers who served in the Civil War. "If you look closely, you can see what looks like fingers on both sides of the white aura," said Markenstein in an email. "I can't explain it, but it sure makes me feel like the spirits are very happy!" Two astronauts are set to blast off for the longest ever space mission, on a trip designed to prepare for possible future expeditions to the Moon, Mars and asteroids. 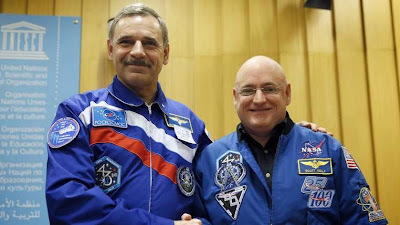 Roscosmos' Mikhail Kornienko and NASA's Scott Kelly will embark on a Russian Soyuz rocket from Kazakhstan in March - and will not return for a year. A number of international space agencies joined forces to preview the upcoming mission and set out their scientific goals at the UNESCO headquarters in Paris. They believe the long stay is necessary to explore the effects of a prolonged stay in space on the human body, with a view to potential Mars missions in the not-too-distant future. Mr Kelly said: "I mean if we're going to go to Mars, we need to have a better understanding about how the human body behaves for longer periods of time in space. The Space Station is a great laboratory to figure that out." The harsh environment of space poses a number of problems that must be overcome for long-term journeys to other planets. One of the biggest problems is a wasting away of muscles due to the zero-gravity environment. They can also expect bone loss of around 1.5% a month, and the constant barrage of radiation can trigger cataracts and even cancer. The pair will be conducting trials on a number of ways to reduce these risks and will also carry out a number of joint experiments. Mr Kornienko said: "Science experiments, biological, observations of Earth, joint American and Russian. As stars go, Eta Carinae is big. It’s old. It’s volatile. And it’s about to blow. So will it really kill us all? The eyes of astronomers have been on this star for decades. And with good reason: It’s about to go supernova. This may already have happened: A supercharged mass of subatomic particles could be blasting its way across the gulf of space towards us. This is what has certain social media sectors alarmed: The enormous flare generated by the collapse of a star more than 100 times bigger than our own could produce a radiation burst powerful enough to kill us all. As such, Eta Carinae has been dubbed the “Death Star”. After all, some scientists speculate such a sterilising pulse has already caused at least one mass extinction on Earth. Others say it may be why we are yet to meet aliens: Most may have been killed off by these semi-regular interstellar explosions. It’s a story of such persistence that it has even prompted the otherwise sedate Scientific American to address the idea. The simple answer is: It could, but it won’t. Interesting video...deserves to be investigated. Did Giants Exist? 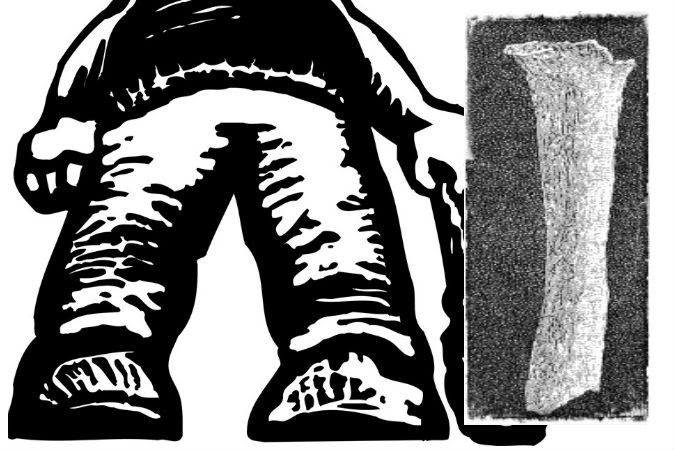 Part 1: Legends and America’s Giant Skeletons and Did Giants Exist? Part 2: Where Are the Skeletons Now?